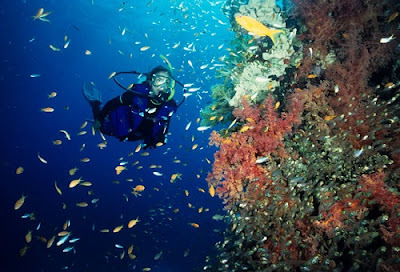 If you want to explore the natural beauty of Indonesia’s underwater, make sure to visit Bunaken Island. This exceptional island is located on North Sulawesi province of Indonesia and internationally recognized as one of the best diving and snorkeling sites in the world. The clear water and breathtaking view will never let you down. Bunaken is a perfect place for those adventurous people who want to connect with the nature and are into wonderful sea world. Planning a trip to Bunaken is simple. The most favorite tourist destination in here is of course the Bunaken National Marine Park. This incredible 90.000 hectares marine park includes five islands and some territory in the North Sulawesi mainland, inviting 50.000 guests per year. This is the spot for diving and snorkeling, where you can see many species of floras and faunas. There are 20 diving points in the marine park, so your adventure will never get boring. If you can’t swim, you can still enjoy the beauty of Bunaken. Simply rent a Katamaran and have a nice cruise on the water. It is a boat with a clear glass in the middle where you can see the underwater view clearly. To get to Bunaken, you can head to Manado first. It is a city in North Sulawesi province. You can take an airplane from Jakarta to Manado. And then, from Manado, take a boat trip to reach Bunaken. It takes around 30 minutes and costs around Rp25.000. Alternatively, you can use the boat from the hotel or resort you’re going to stay at.